Marketplace websites connect buyers and sellers. This terms and conditions template regulates the relationship between your business the buyers (either individuals or businesses) who use the market that your website provides. This template helps you to comply with the Electronic Communications and Transactions Act 2002, so far as you sell to consumers. As far as possible it insulates you from conflict between your suppliers and buyers from your website. It includes strong legal protection against malicious use of your website. It is not important what services you offer. You could be an intermediary for a wide variety of services provided by individuals or companies, or you could specialise in a single sector, like accounting or care homes, or gardening, or. If you supply businesses, your site could create a marketplace for machine tool services or tractor re-conditioning or website design. are hosted in the South Africa - although sellers and buyers could be located anywhere in the world. If your site creates a marketplace for products , not for services , see Website terms and conditions template: marketplace for goods: buyer side. If buyers are required to subscribe (or become members) of your site before they can access the marketplace, then Website terms and conditions template: marketplace for services: buyer subscribes for access should be the other document you need to complement this one. 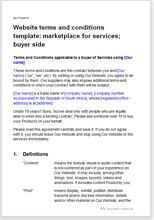 The complementary template that provides terms for sellers can be found at Website terms and conditions template: marketplace for services: seller side. This template helps you to comply with the Electronic Communications and Transactions Act 2002, so far as you sell to consumers. The law in these T&C is largely common law that deals with the basics of contracts: offer, acceptance, price and payment, provision of service, liabilities and risk. By and large, you can set the commercial terms you want. The document should be edited so that it reflects exactly how your business works. Our guidance notes will tell you what you can change safely, and what we don't advise changing.